Jogja is full of andong and becak. What is andong, you might ask? 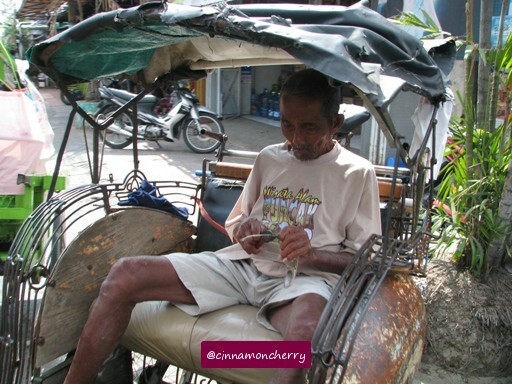 Andong or delman is a horse carriage. You can find many andong and becak in Jogja, especially in Malioboro street. Some are more lavishly decorated, others are somewhat plain. The drivers usually wear traditional clothes. Their traditional hats (blangkon) are unique and you might want to have one as a souvenir. Naturally, after seeing one, our kids began pestering us for a ride. Aza had a good time, he even asked to sit in the front. Ah, becak. They're everywhere in Jogjakarta! Some becak drivers might offer you rides to local T Shirts' factory or souvenir shop (usually bakpia, Jogjakarta's famous pastry). They charge less because they will get a commission from the shops. However this might be a nuisance if you have other plans. My advice is to be firm to them if you want to use their service. Ask them to take you to a specific destination, and that's it. Oh, don't forget to bargain as well. 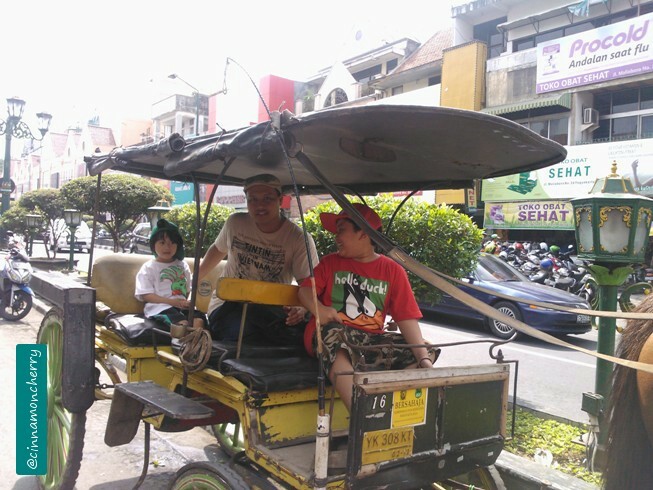 Riding becak or cycle rickshaw in Jogja is fun for adults and kids. I saw three tourists sharing a becak, laughing while taking pictures and talking to each other. I loved it that they were having a great time. Jogja has level roads so the journey is enjoyable. 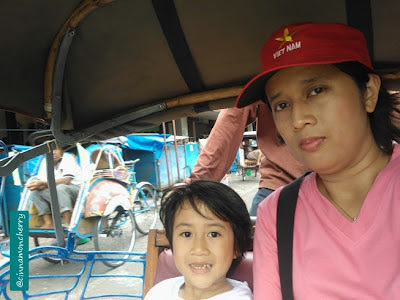 You can ask a becak driver to take you around Jogjakarta as well.